Between 1750 and 1830, and particularly between 1793 and 1815, Newfoundland received large numbers of Irish immigrants. This influx peaked during the Napoleonic Wars and fell off sharply thereafter. Some went on to other North American destinations, some stayed, and many engaged in what has called "to-ing and fro-ing", an annual seasonal migration between Ireland and Newfoundland due to fisheries and trade. As a result, the Newfoundland Irish remained in constant contact with news, politics, and cultural movements back in Ireland. Most of the Irish landed in Newfoundland ports of St. John's and Harbour Grace. Many stayed in these large communities, but others moved on to smaller outports along the coast of the Avalon Peninsula where they could find employment. By the 1780s, the Irish had become the dominant ethnic group in and around the St. John's area, which had a population of about 3200. While a few Irish were tradesmen and shopkeepers, and a handful were merchants, the vast majority formed part of the working-class and were fishermen with little formal education. Many were servants who came to Newfoundland alone, but others had families, in which labour by women and children were essential to the survival of the household. Most families had a small plot of land, or a garden, which was subsistence-farmed to provide potatoes and other crops such as carrot, turnip, and cabbage by which the diet could be supplemented. Central to their lives and culture was their religious faith; institutional religion served as the pivot for a great deal of Irish life in Newfoundland. While several of the leading Irish merchants and propertied men were Protestants, the majority of the Irish were Roman Catholics, and they began to seek to create in the New World the institutional Roman Catholicism which had served as a cradle for culture, identity, and politics in Ireland. As a result, the institutional church which emerged over the next 50 years became the single most important ethnic, social and cultural institution for the Irish in Newfoundland, and its various clergy and leaders were the de-facto leaders of the Irish community in Newfoundland. Second Roman Catholic bishop of St. John's. During the 1st half of the 19th century the Roman Catholic Church was the principle ethnic, cultural, and social institution for the Irish in Newfoundland. Artist unknown. From Benevolent Irish Society (St. John's, NL), Centenary volume, Benevolent Irish Society of St. John's, NL, 1806-1906 (Cork, Ireland: Guy & Co., 1906) 34. Excluded in this period from participation in government, the Irish were rich in cultural customs and practices, particularly religious feast days, festivals, and the seasons of Christmas and Lent. Popular folk beliefs and practices flourished, and the culture included strong oral traditions, of the folklore of fairies, storytelling, wakes, dietary customs, seasonal customs such as the Christmas-time "Wren boys" and mummering, as well as daily customs and religious beliefs and an Irish material culture of clothing, furniture, and building construction. Adherence to Irish-county factions was common among immigrants from Leinster, and especially the more heavily Irish-Gaelic speaking immigrants from Munster. 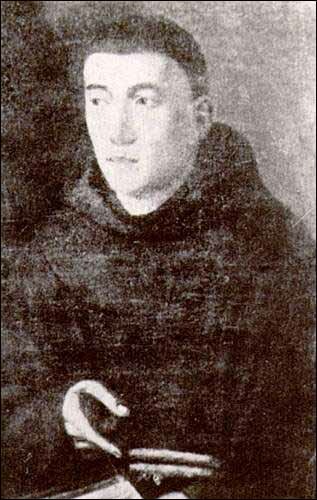 Factionalism was occasionally exploited by some of the itinerant Irish priests who paid no obedience to the first Catholic bishop, James O'Donel, and his successors. The Irish also brought with them a rich repertory of cultural customs and traditions, including county factionalism, which included groups such as the "Yellowbellies" from County Wexford, the "Wheybellies" from County Waterford, the "Clear-Airs" from County Tipperary, the "Doones" from County Kilkenny, and the "Dadyeens" from County Cork. 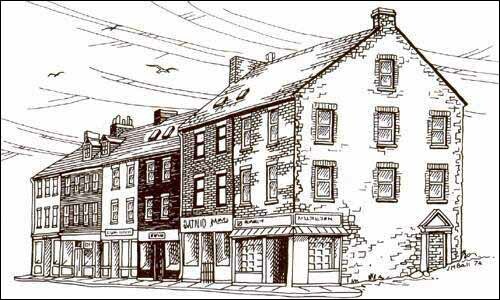 One of the early 19th-century neighbourhoods of St. John's, at the corner of Water Street and George Street, populated with shopkeepers and families from Wexford, remains known to this day as Yellowbelly Corner. The Irish also brought with them an early version of the sometimes violent game of hurling. In St. John's this was played on the town's most significant "cultural space", the Barrens above the town to the east of Fort Townshend on what is now the site of the Basilica. The Yellowbelly Corner Building served two purposes for its owner. It had a shop on the ground floor and a place of residence above for the shop keeper. Drawing by Jean Ball ca. 1974. Reproduced by permission of the Newfoundland Historic Trust, © 1974. In 1800, a cell of the Society of United Irishmen was uncovered in the St. John's Garrison, making Newfoundland one of the few places outside Ireland in which the United Irish rising had political effects. Even at the time of the Napoleonic Wars, political activism rooted in Irish agrarian movements manifested themselves in Newfoundland, in such forms such as the Caravats (who wore French 'cravates' or ties), and the Shanavests (literally, the 'old vests'), as noted by Judge Prowse at the end of the 19th century. Indeed, no other expatriate Irish community outside Ireland can claim such extensive and persistent ethnic, cultural, political, and religious forms as similar to those of Ireland. In the early years of the 19th century, St. John's had a large Irish population with some members of affluence. It was a town with growing influence, and was the cradle of growing cultural and political ferment. Several Irish Protestants, such as Colonel William Haly who had retired after British military service, owned farms on the outskirts St. John's. Many of these Irish both saw social needs which were not being met by government, and desired to belong to a fraternal, gentlemanly organization. In 1806, under Bishop O'Donel's patronage, they founded the Benevolent Irish Society (the BIS) as a charitable, non-profit, non-sectarian society for Irish-born men under the motto "He who gives to the poor lends to the Lord." 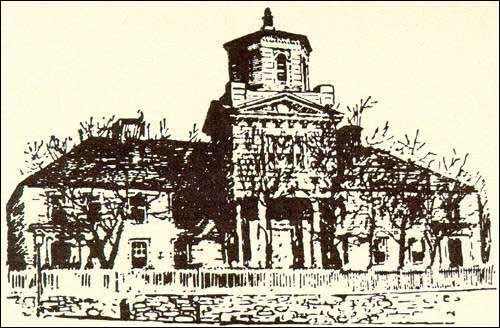 In 1823 the BIS collected a subscription and opened a non-sectarian school in St. John's, the Orphan Asylum, for the education of the Irish poor. The orphan asylum was owned and operated by the Benevolent Irish Society. Artist unknown. From Benevolent Irish Society (St. John's, NL), Centenary volume, Benevolent Irish Society of St. John's, NL, 1806-1906 (Cork, Ireland: Guy & Co., 1906) 108. By the late 1820s the BIS had gradually become de facto a Roman Catholic society, and was the most powerful and influential fraternal society in Newfoundland.